No Wasted Line - A lot of weed whackers seem to go through an inordinate amount of line. Some people complain that they spend more on line in just a few months than they did to buy the tool in the first place. This is not a complaint people have about the ST8600. The automatic feed spool only feeds line as it is needed, with no bumping because it is automatic. You don’t have to stop what you are doing at any time, because the line will always be there to cut through tall grass, thick weeds, vines, etc. There are many great things to be said about the Black & Decker ST8600. For starters, it has a 13-inch cutting swath, so you can cut a wide path as you go along. This is going to make your work a lot easier, and a lot faster. The 5-amp motor ensures that you have all the power you need, when you need it, no matter what the lawn conditions are. Lightweight Design – This trimmer/edger is constructed with a lightweight design that makes it easier to use than other weed whackers. If you need to trim anything overhead, it isn’t going to feel like you are lifting a hundred or more pounds, even if you have to keep it overhead for an extended period of time. Adjustability – The height is adjustable, so no matter how tall or short you are, or the length of your arm span, you will be able to use it in a position that is comfortable for you. The shaft length, as well as the position of the head and handle are easily adjustable with a press of a button or a turn. The handle uses a spring-loaded button for full motion, and locks into the position you want. ​Precise Edging – You will have the neatest, trimmest lawn on the block when you use this tool. The head swivels between trimming and edging quickly, so you can get right along the edges of sidewalks, gardens, and more. There is also a slide-out guide that lets you cut straight and evenly along edges. ​Cord Disconnection – This trimmer/edger has a feature you don’t always find in corded tools: a cord retention system that helps to prevent the cord from accidentally disconnecting while you are working. There is nothing worse than having to stop what you are doing and plug your trimmer back in (we all know once we stop, we don’t want to start working again). ​String Spools – You can easily find replacement spools of line for this trimmer, and they cost less than $10. Because it carefully feeds out just the right amount of line every time, you won’t have to be replacing the spools every couple of weeks like you might with other trimmers. The feeder will ensure that the line is always at the proper length, and it isn’t going to give you more until you absolutely need it. Single Trimmer – While this is no professional-quality trimmer by any means, it is more than adequate for any of the jobs you will need to do around your home. 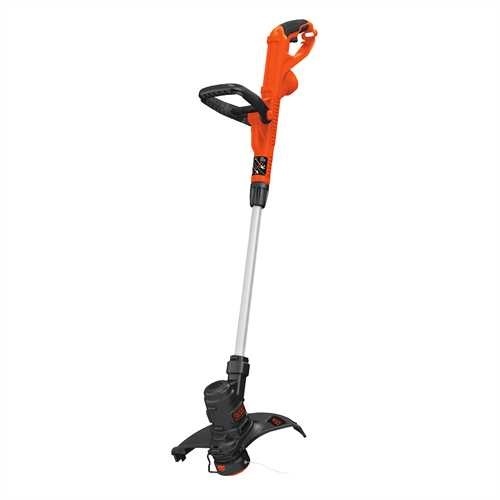 It is a single string trimmer, which is a lot easier to load than dual spring versions. You can also get pre-wound spools if you don’t want to do the winding yourself. You can save a lot of money by using a two-in-one tool, but that doesn’t mean that this is the perfect tool. But, then again, there is no such thing as perfection in anything. There are some things that users don’t like about the ST8600, so we do need to take a look at the pros and cons. That way, you know exactly what you are getting into before making a purchase. Affordability – You really can’t go wrong when it comes to the price of this trimmer. You get two tools for the price of one, and you can find the ST8600 for less than $40 online. This is actually a pretty great deal. Great for Seniors – Because this unit is so lightweight, it is ideal for seniors to use. It is also easy to maneuver, and you don’t have to fiddle with a bunch of buttons and knobs to adjust it or turn it into an edger. It is just a straightforward, easy-to-use tool. ​Easy to Assemble – Customers say that it only takes a few minutes to assemble this tool out of the box. They also say that they don’t go through a lot of string, so they don’t have to spend much time changing the line. Cord – There are a few complaints about the power cord. Some users say that it does tend to weigh down the unit. Others say that it makes the trimmer a bit less maneuverable than the battery powered version. If you are looking for a cordless trimmer, you can find our reviews of a 20 volt model here, and a 40 volt model here. All in all, if you want a lawn and garden tool that will let you take care of both trimming and edging with just the push of a button, the Black & Decker ST8600 may be just the trimmer you are looking for. If you don’t like the idea of using a corded trimmer, there is also a battery powered model that works just as well. This unit is lightweight and easy to use, and even seniors can use it with ease.